Full size 536 × 623 pixels	George Ward of Aston and Cote, Oxfordshire, brother of Thomas Ward? 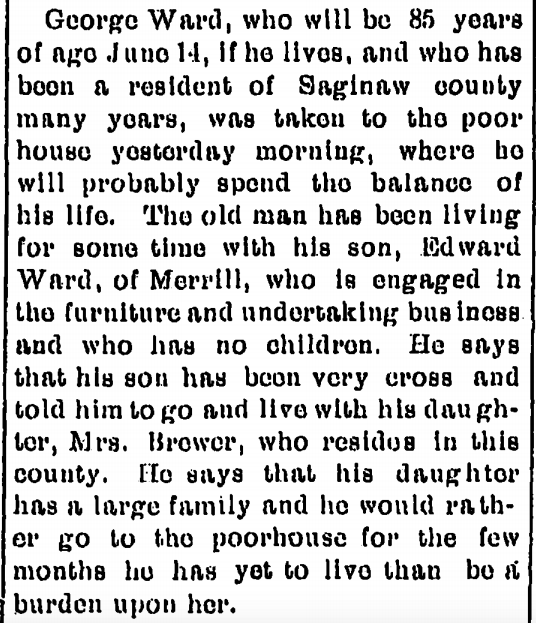 George Ward, who will be 85 years of age June 14, if he lives, and who has been a resident of Saginaw county many years, was taken to the poor house yesterday morning, where he will probably spend the balance of his life. The old man has been living for some time with his son, Edward Ward, of Merrill, who is engaged in the furniture and undertaking business and who has no children. he says that his son has been very cross and told him to go and live with his daughter, Mrs. Brewer, who resides in this county. He says that his daughter has a large family and he would rather go to the poorhouse for the few months he has yet to live than be a burden upon her.